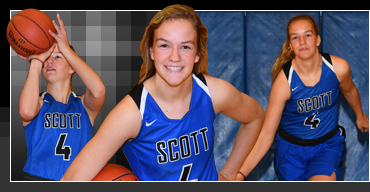 Scott High School senior Summer Secrist is a multi-sport athlete who competed in track and field, basketball and volleyball in her outstanding prep career. Her versatility was recognized in 2018 when she was recipient of a "Triple Threat Award" from the Kentucky High School Athletic Association, recognizing athletes who participate in varsity sports throughout the entire high school year. In track & field, Summer is the reigning Class 2A regional champion in the high jump (4-10) and was a member of the 4x100 and 4x200 relay teams. In basketball, Summer at point guard played varsity for six seasons for the Lady Eagles. She scored 1,752 points in her great career, which ranks her fifth all-time in school history. She helped this year's team to a 23-11 record, capturing the sectional championship and state runner-up finish in the inaugural Kentucky Class 2A-only tournament. She was named to the sectional and state all-tournament teams. Her big games this season for the 37th District champs included scoring a career-high 32 points vs. Boone County, 28 points vs. Campbell County, 25 points vs. Holmes and 22 points vs. George Rogers Clark. Her many honors include being named first team all-region and named to the district all-tournament team for the second time. She also played three years of volleyball for Scott. Her junior year, she helped the Eagles win their fourth straight district and regional championships. She was named to the regional all-tournament team as well as being named 2nd team all-NKY (Enquirer). Summer plans to play basketball at the next level, but has not yet selected a college. A great student who is active in community service, her favorite athlete is LeBron James, favorite book is Divergent, favorite movie is Maze Runner and most-like-to-meet is Drew Barrymore. COACH'S QUOTE – "When I think of Summer, I think of a Warrior. She is one of the hardest working, team oriented, determined player I have had the honor of coaching." ACCOMPLISHMENTS: Scholarship to Miami U. ACCOMPLISHMENTS: Representing Team USA at 2018 Junior Pan Pacific Championships in Fiji. ACCOMPLISHMENTS: Committing to U. of Akron & breaking career goal record at Boone. ACCOMPLISHMENTS: "Going undefeated & winning CovCath's 7th football state title."